WAWONA – Despite most lodging options inside Yosemite National Park remaining closed due to the government shutdown, The Redwoods in Yosemite, a collection of more than 100 private vacation rental cabins in Wawona, remain open. Due to the park’s closure, visitors traveling through Yosemite National Park during the government shutdown have no access to restaurants, public restrooms or shopping, nor are they permitted to stop their vehicle to stretch their legs, give their pet a potty break or to take a picture of the spectacular Yosemite Park views. There is an exception, however, as The Redwoods in Yosemite with year-round vacation home rentals, event facilities, gift shop, bistro and public restrooms, remains open during the shutdown.The Redwoods consists of 132 vacation rentals located 6 miles inside the park from the southern entrance in the historic town of Wawona. 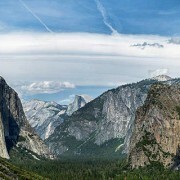 When Yosemite National Park was created it did not include the Southern area of the current national park boundaries. In that time, private land owners subdivided Section 35 into lots. Later, Yosemite National Park was expanded to the south to include the Mariposa Grove of Giant Sequoias, and that expansion included Section 35, meaning it was now inside the national park. Today this area is called Wawona which includes the historic Wawona Hotel and Golf Course, the Pioneer History Center and, of course, The Redwoods In Yosemite. In Section 35 there are 300 plus homes, a school, a library, and general store, fire department and other facilities. The Redwoods In Yosemite is a privately owned management company that manages 132 privately owned homes for vacation rental. The fully equipped vacation homes range in size from studio to six bedrooms, most with fireplaces or wood burning stoves and private decks with BBQs. Many are pet friendly and have spectacular views of Yosemite’s Wawona Dome and the South Fork of Merced River. In the nearby town of Oakhurst there are many restaurants and antique shops and several theaters. The “other” Giant Sequoia grove, Nelder Grove, opposed to the Mariposa Grove which is closed, is located just 30 minutes outside of the Park and is open.